Back in the late 70s, that insurance salesman in County Carlow wasn’t getting the best of receptions from Jane. During the conversation, he noticed, “couldn't help but notice”, that her children had ecxema and said that goals milk would be a help. Jane said thanks very much for the tip and sent him on his way. An hour or so later, she sighed as he returned. This time with a gift. He lifted a goat out of the boot, presented her to Jane and carried on his way. She never saw that salesman again but the goat led to greater things, she recalled, as she introduced her current cheeses at the launch of the International Wine and Food Society Munster branch 2015 programme at Jacques restaurant in Cork on Wednesday evening. With the help of a library book, Jane started rearing goats for their milk. Then she had too much milk and that led to cheese production. Then she had too much cheese and started giving it away. In the 90s they spotted a farm and a large goat herd for sale in East Cork and with the help of her “enthusiastic husband”, Ardsallagh was created. This small family run business has grown steadily, and you can buy their products not only in local farmers markets, but also in national supermarket chains. 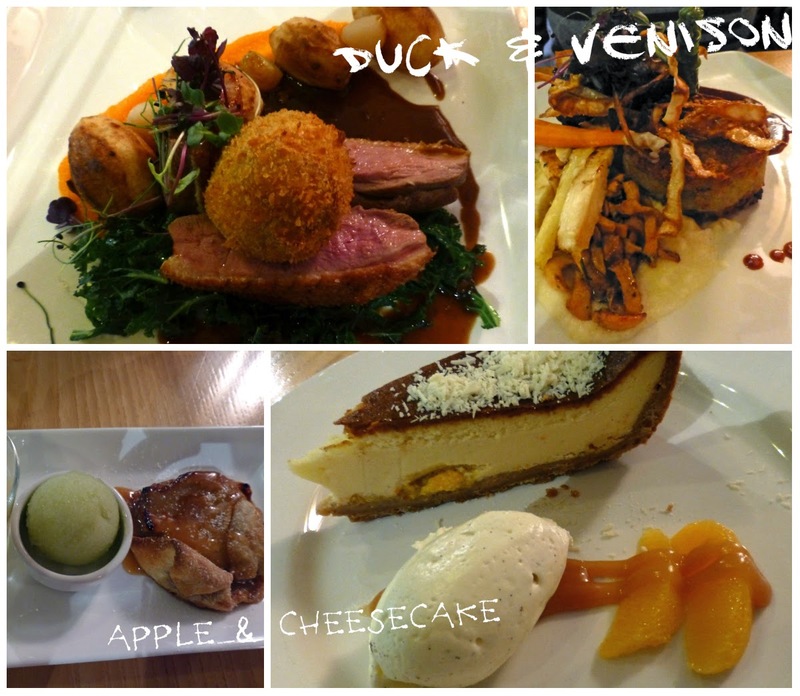 Ardsallagh products can also be found on the menu of many well known restaurants across Ireland. The whole family contribute toward the smooth running of the farm and dairy. They use the ladle method, slowly and carefully, making a beautiful cheese that is easily digestible. Oh, by the way, the eczema cleared up! The Ardsallagh cheese was highlighted by Jacques with no less than five different plates of it presented, starting off with a Baby Gem Cup with Ardsallagh, apple, green onion, and Highball Orchard Syrup. Next up was a delightful Middle Eastern Beetroot, pureed with a little potato and yogurt and cumin and topped with Ardsallagh and Hazelnuts. The dishes just got better. The guests were next impressed with Portobello Mushrooms stuffed with soft herbs, red onion, and Ardsallagh with Spicy Granola. 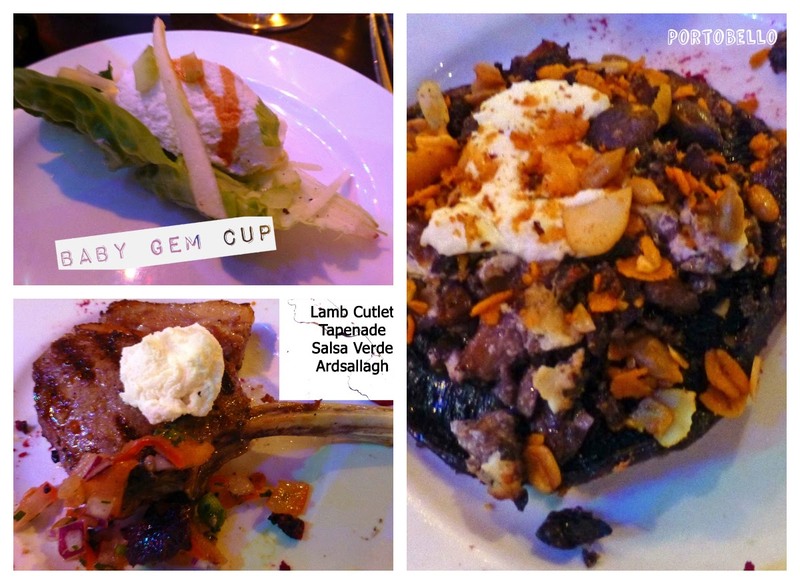 No skimping by Jacques and soon we were tucking into the delicious Lamb Cutlet, tapenade, Salsa verde and Ardsallagh. What would the innovative Jacques team come up with for dessert? Another delicious surprise: Medjool Date stuffed with Ardsallagh, Almonds and a full circle of Blood Orange. A beautiful sweet note to finish the evening. It was a well attended encouraging launch for the local IWFS committee that consists of Colm McCann (chair), Eithne Barry (vice chair), Beverley Mathews (secretary), Richard Scott (treasurer) and Billy Lyons (PRO). Next event is the Beer v Wine Smackdown at L’Atitude (Mar 19th), featuring Caroline Hennessy and Colm McCan. Other events, dates to be confirmed, include A Day (and meal) at Lismore Castle, a visit to the Belvelly Smokehouse, a visit to the Leinster Branch, a summer road trip, a harvest visit to Longueville House, and an Italian Evening at the Farmgate Cafe. Don't forget to return your membership forms to Branch Secretary, Beverley Mathews, International Wine and Food Society, c/o L’Atitude 52, 1 Union Quay, Cork. 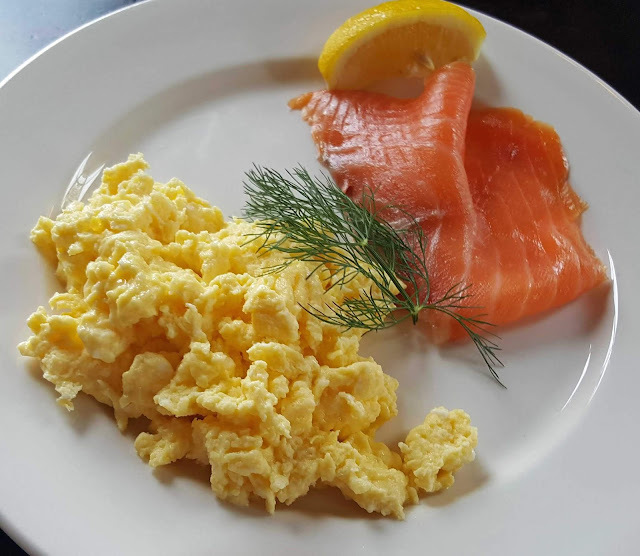 Wild Irish Foragers are a farm based family business in Shinrone, Birr, Co Offaly, and frequently seen at food fairs and festivals; their products are also available in the English Market and the Village Greengrocer in Castlemartyr. They will have a stall at the big Shed for the 2015 Ballymaloe LitFest. There is a full list of stockists here. I always enjoy products from the elderberry tree, even though I often get a headache if I handle the wood itself! So it was on the cards that I’d like this Elderberry Syrup. I sure did, particularly drizzled over the morning porridge. Very flavoursome and my Taste of the Week. The following paragraph is from their own Facebook page. Check here for a full list of the products from Wild Irish Foragers, including other syrups, Wild Shrubs (drinking vinegars), preserves, sauces and much more. This is the native land of Chardonnay and this is an excellent expression of the grape, pure and perfect. Colour is a light yellow and there are complex aromas, including floral and fruit strands. The aromas persist on the palate where you can taste the brilliant purity, the flinty flavours; quite an elegant wine with a long finish. Crisp and mouth-watering, one of the very best in this sale and Very Highly Recommended. Lovely aromas and a light gold colour. This is one of the winemakers’ “Collection Fruitée” and it lives up to the name. Fruity (peaches, pears), well balanced, fresh and crisp and very refreshing. Recommended. Colour is light straw, clean and bright, with fruity aromas. On the palate, there is a nice fruity tang, melons and gooseberries to the fore, with good acidity and a crisp dry finish. Recommended. The area of Saint Bris is unusual; its wines are made from Sauvignon blanc rather than Chardonnay which is grown throughout the rest of Burgundy. Domaine Balland Chapuis Coteaux Du Giennois Montagnes Blanches 2013 (Loire), 12%, €10, SuperValu French Sale. This Sauvignon blanc is from Giennois, a little known Loire region and neighbour of the famous Sancerre. Colour is a light straw and there are inviting fruity aromas. There is a sharp and tingly introduction to the palate, then white fruit flavours (apple, pears, hints of citrus, though apple more prominent on 2nd sampling 24 hours later), all fresh and lively and a good dry finish. Recommended. Chateau Manon La Lagune, Blaye Cotes De Bordeaux 2012, 13%, €9.00, SuperValu French Sale. This well priced red is a excellent blend of Merlot (60%), Cabernet Sauvignon (30) and Cabernet Franc (10). 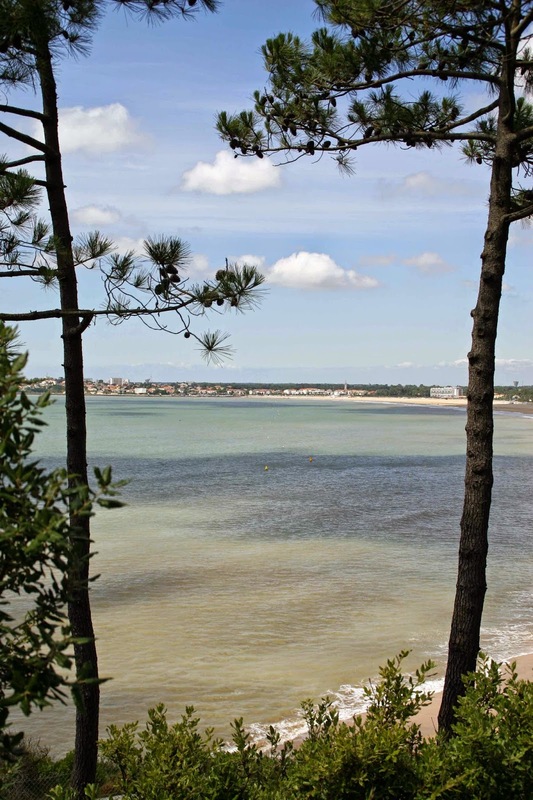 Many Irish families have holidayed in the Charente campsites close to Royan. Some will have seen the timber hut in the village of La Palmyre selling wines from Blaye which is not too far away in the Bordeaux direction. A nose of blackcurrant aromas is followed by refreshing black fruit flavours on the palate, some spice too, with a soft and smooth mouth-feel. Any prejudice I had about Blaye maybe not being good enough because it is in the edge of the Bordeaux appellation geographically, was quickly and pleasantly soothed away, all that before a good finish. Highly Recommended. 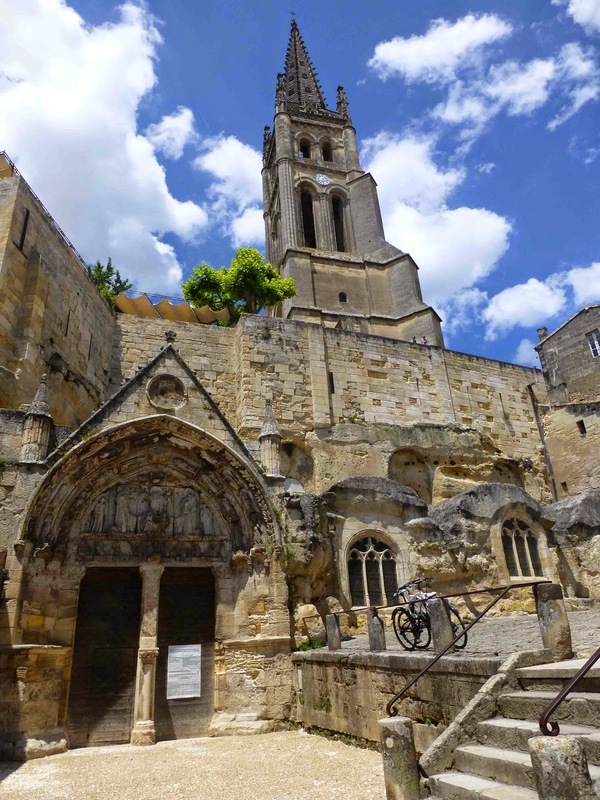 The wines of Saint Emilion are much better known here than those of Blaye. This is again mainly Merlot (about 65%) and the balance is Cabernet Sauvignon. Red fruit aromas and the colour is a little darker than the Blaye. In the mouth, there are fruity notes galore in this typical Saint Emilion, good acidity too, of course, all leading to a well balanced wine. Young but drinking really well and Very Highly Recommended. Piedmontese Steak Highlight of Tipp Top Meal. Why not putt into the Fairways sometime? 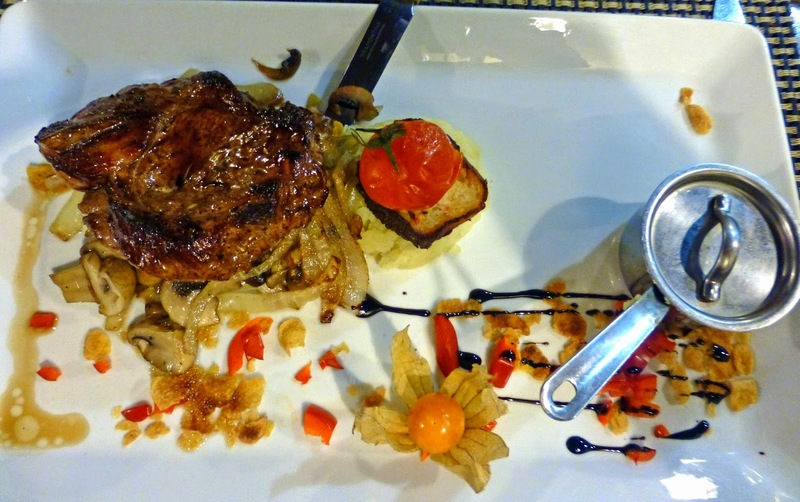 Often had samples of the Irish Piedmontese beef at food fairs and festivals and it was great to be able to order a sirloin steak, all for myself, at the Fairways Bar and Orchard Restaurant in Kilruane (near Nenagh) recently. And, glad to say, it was excellent, tender and full of flavour, quite a treat, served with a mini-saucepan of serious garlic butter and an excellent selection of vegetables. The meat and the veg were cooked to perfection. 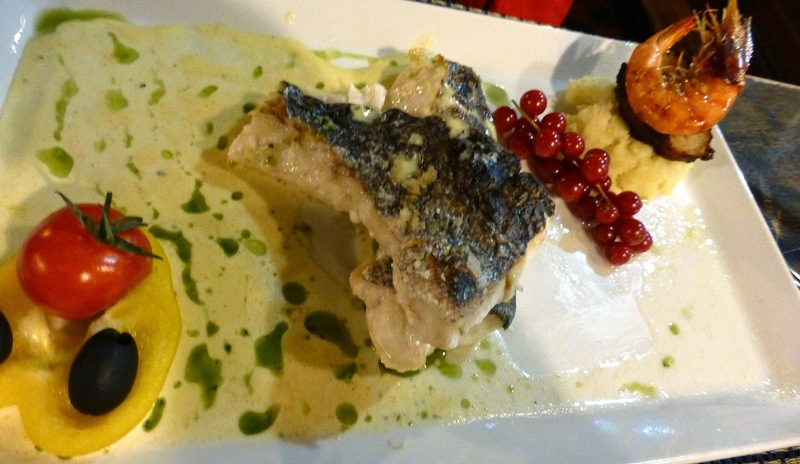 The Fairways - it is near a golf club - is famous for its fish and usually has quite a selection. CL went for her favourite Hake and she too hit the jackpot. Nice selection of accompaniments on the plate too and the red-currants were a surprisingly outstanding contributor. Again, the fish was properly cooked and presentation all round wasn't bad either. 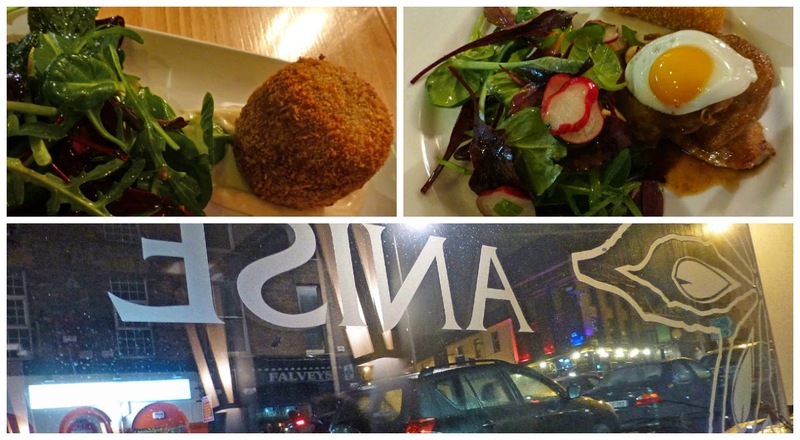 The menu features lots of local produce and, after an unexpected and well received amuse bouche, we enjoyed our starters (each €7.50). CL plumped for the Bluebell Falls Honey & Thyme Goat’s Cheese With Cumin, Baked in Kataifi Pastry, Coriander, Mango & Chilli Salsa. Quite a plateful and a very good one, excellent flavours and nicely presented. 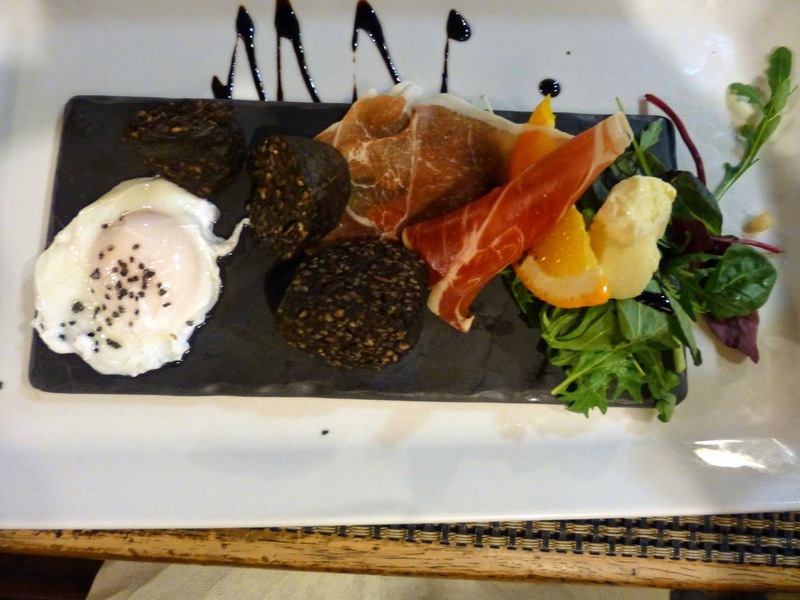 Must admit mine looked like a full Irish when it arrived: Tournafulla (West Limerick) Black Pudding, Soft Poached Egg, Garnished With Rocket & Bacon Flakes, Gooseberry Sorbet. The pudding was excellent, the flakes a nice touch. A terrific starter and indeed, both plates went back without a speck of food. No room for desserts though after the excellent courses. The pub/restaurant, a few miles east of Nenagh on the Cloughjordan road, is spacious (over 50 covers) and has lots of memorabilia, some of it golf related but there is much more, including an old postman's bike mounted on a small mezzanine to the side of the bar. Quite a nice place. You’ll get a lovely warm welcome here and excellent grub. Recommended if you find yourself in North Tipperary. Well worth a call or even a detour! Star Anise Shines. Rainy Night In Bridge Street. Rainy Night In Bridge Street. A combination of cool drizzle and the sackcloth links of Ash Wednesday weren't enough to keep the punters away from Star Anise this week. We led the charge to the Bridge Street venue, its comfortable seating, its attractive decor and the warm welcome from Virginie Sarrazin. Soon we were seated, sipping bubbles and looking at the menu with the odd glance at the drizzle falling through the street-lighting onto the cars and pedestrians. Virginie, originally from Lyon (France), founded the restaurant in 2002. She had been surrounded by good food from a very early age, with a Chef for a father and a Wine expert as a mother, and she grew up in a region known as the Gastronomic Capital of France. Head Chef Carolyn Buckley, originally from Millstreet, qualified from CIT in 1998. She first started learning her trade in the kitchens of the famous Arbutus Lodge in Montenotte, and Lovetts in Douglas, before taking off to France in 1999. Then, she spent ten years in Parisian kitchens before joining Star Anise in 2012. 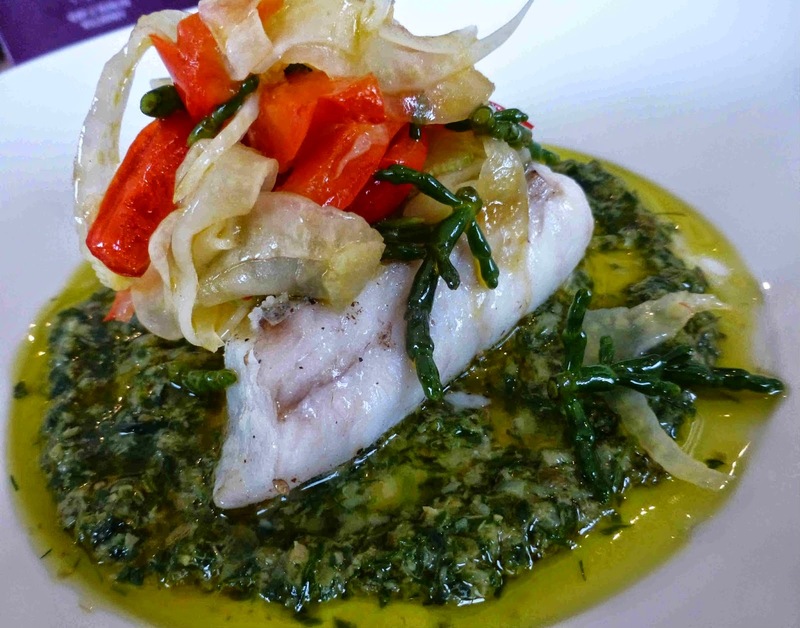 The aim here is to produce “simple honest food and work on offering maximum taste and quality of local ingredients”. It styles itself as a “Mediterranean” restaurant but the accent is French. I reckon they hit the target last Wednesday, as they do consistently. The menu is not the longest but each and every dish begs attention. And there is always a special or two, such as the Crab Cake that CL started with. Not in the least complicated, just well cooked and presented and the chilli mayo adding a little extra heat to the engaging ensemble. My starter, Roast Quail, was another highlight, served with Polenta chip and quail egg, and leaves. So that was two empty plates heading back to the kitchen, starting a pattern that would continue through the three courses. You may have wine here by the glass, carafe, and more by the bottle, from quite an impressive list. We settled for a glass of Barbera each and that went very well indeed with our splendid main courses, CL’s Venison and My Duck. Local craft beers are also available. Hard to resist desserts when there is a French influence at work and we didn't! I know Mardi Gras was the day before and we hadn’t indulged that day so we made up for it. 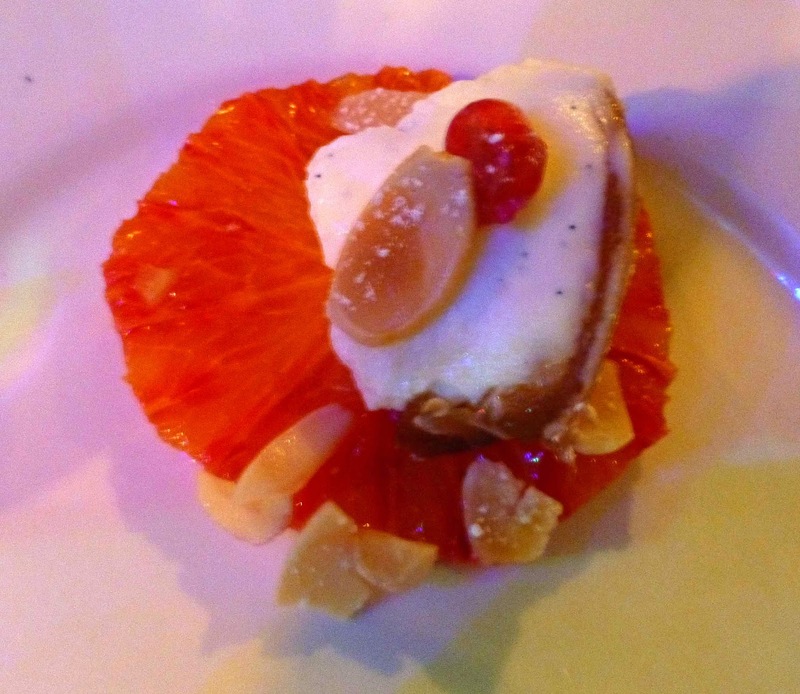 Mine was a delightful White Chocolate and Orange cheesecake while CL, who loves her apple desserts, was in apple heaven with a three way expression of the humble fruit, the highlight being the Tart Tatin. So there you are, six empty plates and two happy customers! Very Highly Recommended. Cole cheese was one of last year's visits. Jacques have chosen the wonderful Ardsallagh cheese from East Cork as their theme for the evening and have devised a brilliant menu of 5 dishes using this amazing local cheese. Made by the Murphy family for more than a decade, Ardsallagh Cheese uses milk from goat's farmed by the Murphy family as well as other local farms. From small beginnings a lifelong love affair with the animals began.The Murphy children can remember having a goat in the garden for most of their lives and the hobby has grown into a successful business. The evening will kick off at 7pm with a prosecco reception followed by a fun and informal tapas-style meal during which you'll have the opportunity to meet other members and we will share the programme for the year with you. Tickets for the event cost €25pp which includes the prosecco reception and meal. The event is open to existing IWFS members and those who are interested in becoming members. If you'd like to attend next Wednesday, please RSVP to iwfsmunster@gmail.com by Monday 23rd February. Please pass on to anyone else you think would be interested in attending. We look forward to seeing you next Wednesday in Jacques! The Munster branch of the International Wine and Food Society (IWFS) was established last year with a view to bringing people with an interest in food and wine together to promote local food and wine businesses and also create opportunities for socialising and having fun with like-minded people. The branch organises a number of events throughout the year from food and wine tastings, dinners, talks, visits to producers, etc.., which members or guests can attend. It is open to everyone with an interest in food and wine and is not intended for trade. There's also the added bonus of international membership, which means members can attend various events being organised by the IWFS around the world. If you'd like to know more about the IWFS, you can check out the website here http://www.iwfs.org or send us an email. Some were worried that this limited edition Redbreast Mano a Lámh would be dominated by the sherry, the whiskey having been matured exclusively in first fill Spanish Oloroso sherry casks. Certainly, you get sherry aromas, especially early on, and indeed some flavours too but, no mistake about it, this is very much a whiskey, very much a Redbreast, enhanced by its encounter with the Spanish wood and is my Taste of the Week. If you join the Stillhouse (no fee), you’ll get special offers from time to time. Not sure though if they have any of the original 2000 bottles of this one left. Must say, aside from the odd offer, there is a wealth of information on the site and it is well worth a look. 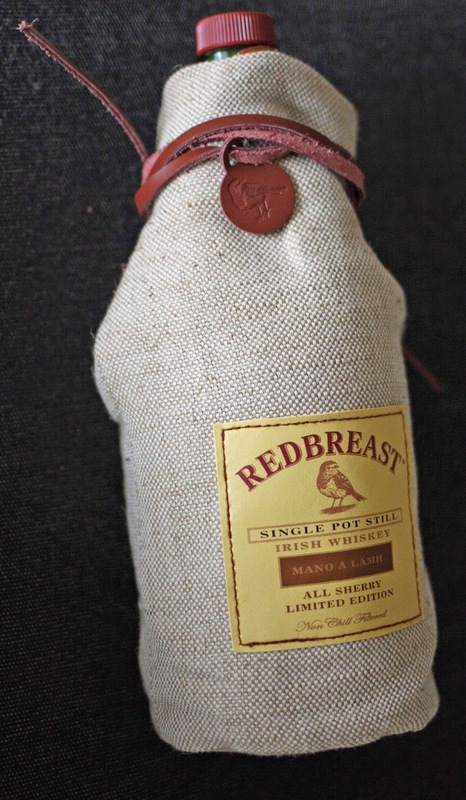 The Single Pot Still site: Redbreast Mano a Lámh is being released exclusively to members of The Stillhouse. While the core Redbreast range is matured in a combination of American bourbon and Spanish oloroso butts, Redbreast Mano a Lámh luxuriates in this signature sherry style by bringing together whiskeys which have been matured exclusively in first fill Spanish oloroso sherry casks, imparting distinct, rich, fruity flavours and a full body. Crus of the Côtes du Rhône. Take Three. More If You Like! Vines under the Dentelles in Provence. 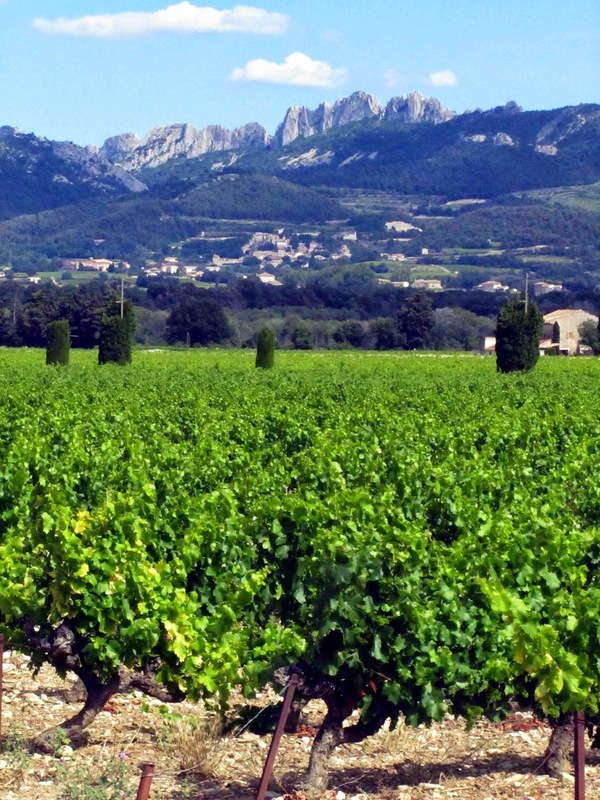 Taking a look today at three wines from the Rhône. The first two are from the northern Rhone, the third from the south. All are crus of the Côtes du Rhône in the same way that Gigondas and Condrieu, for example, are. All three examples, currently featuring in the SuperValu French Wine Sale, are pretty good, though my preference is for the Vacqueyras. By the way, there are 16 crus in all along the Rhone. Hermitage is perhaps the most highly regarded of the Northern Rhône villages and Croze Hermitage is a larger area that surrounds it and covers 11 communes. You'll pay a premium for the Hermitage wines but there is some class in this one also. Fruit aromas and spice on the nose and there are clear black fruit flavours on the finely textured palate and then a good finish. Highly Recommended. They suggest pairing it with lamb and red meats generally. We found it a great match with Comeragh Mountain Lamb. (Just pure chance that we had some handy!). The Saint Joseph area is on the opposite bank, more or less directly opposite Hermitage and, like the Croze Hermitage above this is made from one hundred percent Syrah. Color is a deep red and there are fruity aromas. On the palate you have the darker fruits (plums and tart black currants) and some pepper in a smooth mouthfeel, the finish good and long. This bottle was tested over two nights and on the second tasting, the blackcurrant dominated as the plum had on the first. In any case, the wine is Highly Recommended. The Southern Rhône is mostly in Provence and Saint Roch is located in front of the Dentelles de Montmirail mountains (hills really) between Vacqueyras and Sarrians and close to other famous wine villages such as Gigondas and Beaumes de Venise, all under the gaze of white topped Mont Ventoux. It is the classic GSM blend of Grenache, Syrah and Mourvedre. This dark red has fruity aromas and hints of liquorice. There is an excellent balance of fruit and spice on the palate; it is full-bodied, round and robust, with a nice texture and a good finish and is Very Highly Recommended. Organised by the Alliance Française de Cork, the 26th Cork French Film Festival showcases the best in current French cinema and is taking place in Cork from March 1 to March 8. A real treat for lovers of food and wine is the screening of the documentary Natural Resistance, directed by Jonathan Nossiter, which follows a group of Italian winemakers dedicated to resisting the prevalent use of chemicals. A former sommelier Nossiter’s Mondovino, a documentary about the globalization of the wine industry, was nominated for the Palme D’Or in Cannes in 2004, one of only three documentaries ever nominated in the history of the festival. Nossiter didn't foresee returning to the topic until last summer when he found himself in Tuscany, seated with Italian winemakers dedicated to resisting the prevalent use of chemicals. Nossiter instinctively turned on his camera and continued to follow these subjects against the sun-kissed backdrop of Italian vineyards. The screening of Natural Resistance will be followed by a rustic Italian inspired banquet in the Ballymaloe Grainstore paired with 'natural wines' from the growers featured in the film. The wines will be supplied by Pascal Rossignol from Le Caveau while the film and wines will be introduced by Doug Wregg from Les Caves de Pyrenes. Casa Coste Piane is a tiny 6-ha, in Santo Stefano, heart of the Valdobbiadene area, owned and run by Loris Follador. For generations their wine had been sold in bulk, but since 1983 they decided to bottle the production themselves. The organically-run vineyards lie on slopes close to the cellar. The vines are on average 60 years old (some are pre-phylloxera!!) and their roots can grow up to 30-40 metres long. This Prosecco is a gem, it is one of the few made in the champenoise method wherein the second fermentation takes place in the bottle. After this the wine spends a further four weeks ‘sur lie’. The process of “disgorgement” is not practised, therefore the yeasts are still present in the bottle… any haziness is entirely natural. ‘We are a farm with 20 ha of vineyards, cereals, animals, B&B and a restaurant using exclusively biodynamic and organic products, mainly coming from our farm. Elena Pantaleoni owns this wonderful 50-ha organically-tended estate where wild herbs grow freely between the rows and no chemical fertilizers, weed killers or pesticides are ever applied. Trebbiolo Rosso is a natural wine matured in stainless steel tanks. The nose is fresh with cherry and red berries mingling with wilder notes. Lively and juicy, the palate bursts with sweet/sour morello cherries and hints of spices. 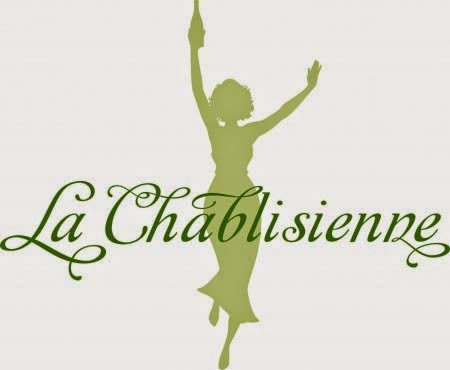 In all, it is a lovely, fresh, lively and fruit-driven wine which is best enjoyed with food. ‘La Stoppa seem to delight in doing the unexpected: whites that aren’t white, that age and reds for drinking young. This is the first vintage of the Trebbiolo (named after a local river) that isn’t frizzante although there is certainly a little bit of residual CO2. Wild, earthy, yeastiness on the nose, incongruously like fresh vanilla pod with its earthy sweet-leathery notes. Aromas of small berries, blackberries, myrtille. Dryish on palate, which is meaty, earthy, spicy. Youthful and vibrant with a slight fizz on the tongue. Cries out for a big plate of charcuterie and cheese and some top class air-dried hams. 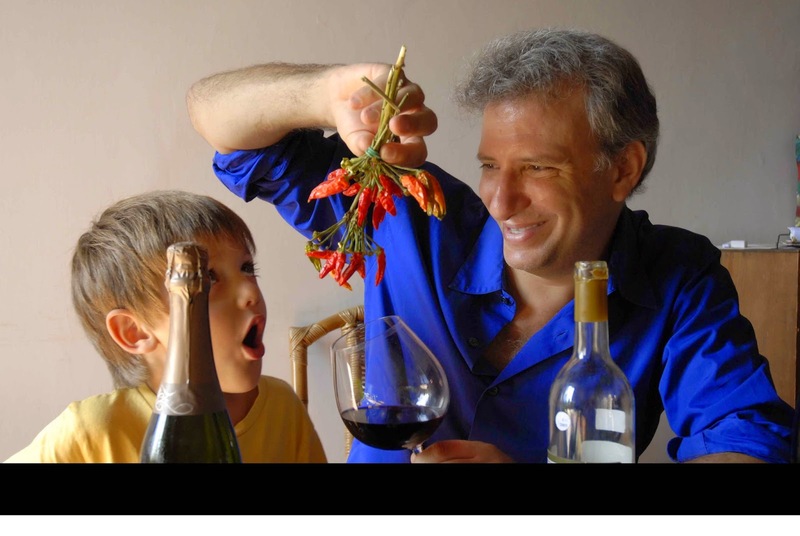 Giulio Armani is the winemaker at La Stoppa (Emilia Romagna). This wine comes from his own biodynamically tended vineyards. Having reached perfect ripeness, the grapes are hand-harvested and left to macerate with their skins for 7 to 10 weeks, giving the wine wonderful complexity, structure, little tannins and its light orange colour. Neither filtered nor fined, the slightly cloudy appearance leads to a floral nose with apple, orange flowers, orange skins and pear hints. The palate is richly layered and intense, with gorgeous apple and honeyed flavour wrapped in impeccable acidity and minerality. For afterwards, we will have two little organic Sicilians Ciello rosso and bianco -Inexpensive, but beautifully made and full of authenticity! Made from organic grapes, fragrant and crisp, Ciello Bianco Catarratto is amazingly fresh and vibrant, delicate flavours of white fruit, hints of peach and lemon zest mid palate and soft notes of marzipan on its bright finish. The dynamic Vesco family took over the winery 10 years ago and have since revolutionised the viticultural practices and invested heavily in cutting edge technology for the winery and bottling line. Their hundred hectares of organic vineyards are located high up in the hills above Alcamo. The wines are all certified organic and planted on south-east facing slopes on sandy soils 150 – 300m above sea level. The climate is clearly suited for producing the best quality grapes. The vineyards in three main sites: Alcamo for Catarratto and Nero d’Avola; Marsala for Grillo and Pantelleria for the Zibbibo which that produces their delightful Passito di Pantelleria. The grapes tend to be picked earlier in the year than many of their neighbours which produces their customary bright, fresh style of wine. The results are evident in the fragrant, crisp Catarratto and perfumed, fresh Nero d’Avola. These wines are a million miles from the overripe styles made by many of their peers. Night harvesting and modern temperature controlled fermentations result in bright, fresh, modern wines. Fragrant and crisp, Ciello Bianco Catarratto is amazingly fresh and vibrant, delicate flavours of white fruit, hints of peach and lemon zest mid palate and soft notes of marzipan on its bright finish. Cloughjordan Cookery School. Layers of Knowledge. Greene’s Supper Club Launch. No Stone Unturned! Zamora. Belts and Braces. And Bubbles Bros Wines. Les Gourmandises. Vive la différence.